It’s not uncommon for school auction themes to be inspired by children’s books. This Wonderland auction was inspired by the book Alice’s Adventures in Wonderland. I worked this event earlier in the year. The committee put a lot of care into creating this experience. Everywhere I turned I saw clever details that supported the theme. 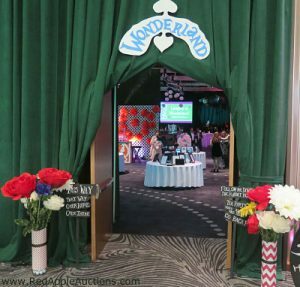 View the video to see how this auction committee re-imagined Wonderland for their own school fundraiser. This was a “strolling supper” concept — no sit down dinner. In addition to bidding on silent auction items during the reception, guests could pay t0 play a wine ring toss game. If you’ve got a favorite auction theme based on a book, I’d love to hear about it below! In the last few months, I’ve worked several school auctions with themes pulled from books. This is one, but I’ve also seen themes from Dr. Suess’ Oh the Places We’ll Go and Roald Dahl’s Charlie and the Chocolate Factory. Very interesting theme. I wonder if the “strolling supper” detracted from the auction in any way? Was food removed before the live auction? Bill, the easiest auctions to run are sit-down dinner functions. Among auctioneers, sit-down dinners are known as the easiest to manage/control and usually have the best financial results. So yes — changing to something like the set-up highlighted in the video makes the auction much harder for the auctioneer. That’s one of the reasons some auctioneers will try to persuade nonprofits not to have this style of event. It’s harder to control guests, engage them, see bids, focus attention, etc. But of course, nonprofits and guests want to try other types of set-ups as they get bored with sit-downs. Guests want to move … they want to socialize with many other people (and not just those people at their table) … they want to have a different style of food that’s best suited for food stations … etc. The desire to try new event styles leads to something like this. I work with a number of clients (this one included) who run events like this one; they hate sit-down dinners and haven’t had one for a few years. To your specific question – yes, the food stations close before the auction begins. Also, this set-up is only effective for certain sizes of groups and venues.